Wes Anderson’s latest film, The Grand Budapest Hotel involves a hotel at the height of popularity and elegance, a country between wars, a high minded libidinous concierge attracted to older, wealthy guests, a loyal lobby boy, a valuable Renaissance painting decreed in a will, a vengeful family, a grave miscarriage of justice, a thrilling jailbreak, a bizarre shootout, death, murder and, most significantly of all, love. Beyond the handcrafted detail that has become characteristic of his films, past the dazzling cast list of Anderson regulars and some new recruits, The Grand Budapest Hotel reveals itself with a beating heart of gold. 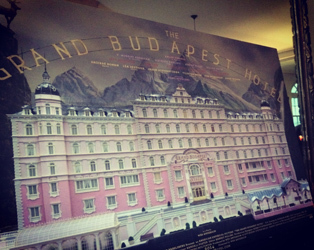 The Grand Budapest Hotel is now showing at the IFI. To celebrate the release of Wes Anderson’s latest madcap movie, we have a very special prize to give away – a canvas print of the film poster (pictured above). To win, just answer the following question before midday, this Thursday, March 13th and this beautiful large canvas could be all yours! Q. Which of the following actors has appeared in almost every Wes Anderson film?